Dr. Carla Calcaterra, 22 weeks pregnant when this photo was taken, showing a 3 year old that coming to the dentist is fun! Drs. Nicholas and Carla Calcaterra have a long history of treating children. While many general dentists do not treat the pediatric population, we welcome them with open arms! 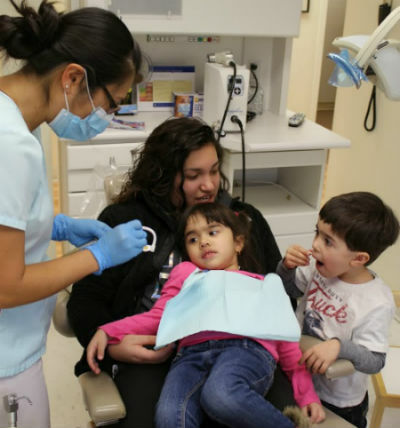 We find that we are able to effectively treat the vast majority of kids, thereby allowing multiple generations to receive dental care in our office. Kids are not just small adults. They have unique dental needs requiring detailed knowledge in the area of growth and development, child psychology, and of course dentistry. A kid friendly environment, including TVs in treatment rooms, games in the reception area, and other details are also important. We strive to provide all of these in our Orange, CT office to allow for ideal care. One of our hygienists getting ready for this little girl while her brother looks on. Dental Sealants: dental sealants are protective coatings placed on permanent molars as they come in. They reduce the likelihood of cavities by more than seven times! No needles are required. Topical Fluoride: fluoride applied topically strengthens both baby and adult teeth and makes them more resistant to cavities. Space Maintainers: space maintainers are small brackets placed after the loss of certain baby teeth to prevent shifting and crowding. White Fillings: just like adults, kids do get cavities, and we address cavities by removing the decayed portion and replacing it with durable white filling material. Nitrous Oxide: also called laughing gas, nitrous oxide can help a child get through a procedure that he or she may not be accustomed to. We have nitrous oxide available when necessary. For those patients (kids or adults) with Celiac Disease or Gluten Intolerance, we were the first dental practice in Orange offering a gluten free dental visit! Currently, we are one of the few practices in all of Connecticut offering this needed service. Because of this, we have families from all over the Greater New Haven area coming to us. See this page for more details on gluten free dentistry. 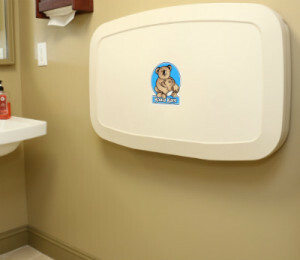 Our infant friendly bathroom with changing table. Unlike some other offices, our policy is that parents are allowed to accompany children into the treatment rooms for all appointments. We will file claims with all dental insurance plans and are “in network” with most dental plans. For kids, we participate or “take” the CT Husky insurance plan, as well as many variations of it, frequently known as Access Health CT. For more information on the insurances with which we participate, visit our dental insurance page, or call our office. 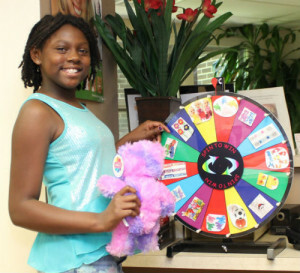 All kids get to spin our prize wheel when they’re done! Our entire clinical team has years of experience treating children. While Drs. Nicholas Calcaterra enjoys seeing kids, Dr. Carla Calcaterra is our resident kid expert. In her residency she spent significant time in a pediatric clinic gaining valuable experience. Prior to becoming a dentist, she was a classically trained pianist and piano teacher, and was a highly sought after teacher in the Boston area. Her ability to inspire 5 year old kids to play Minuet in G by Bach has made her excellent with getting kids into the dental chair and to start brushing at home. 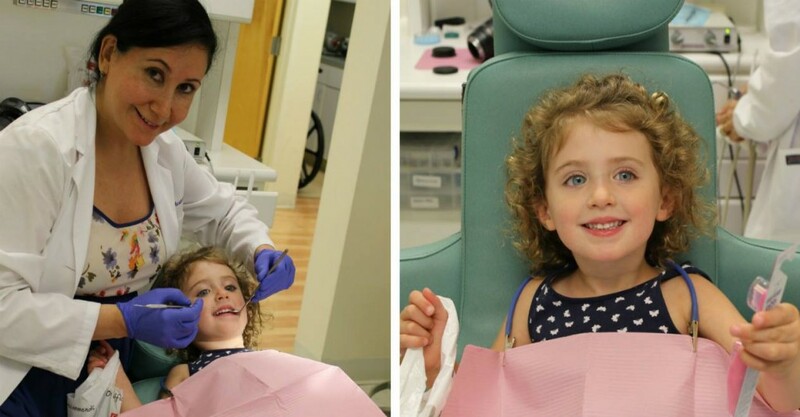 Because of our experience and commitment to seeing hundreds of kids from the area, both doctors serve as Dental Consultants to Bethesda Nursery School located in New Haven. Call our office at (203) 799 -2929 to learn more or go to our appointment page.